The Energy Journal Roundup is a monthly post listing citations and abstracts from some of the peer-reviewed literature published in various energy journals around the world. In Estonia technologies for oil shale mining and consuming have been continuously developed for more than 80 years. By March 2006 one billion tonnes of oil shale had been produced in Estonia. Since the 1960s, Estonia has been the largest oil shale producer and consumer in the world. In the 1980s about two-thirds of the world’s oil shale output came from Estonia. 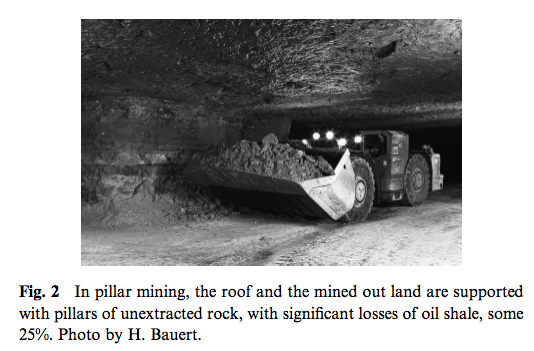 Serious problems in the mining complex are connected with large losses of oil shale at mining and enrichment (more than 30%) and voluminous dewatering (25 m3 per tonne of oil shale). After mining and beneﬁciation, much limestone remains unused and is deposited in waste dumps. Oil shale waste and waste heaps may be considered a rather innocent production residue; however, from time to time they are subject to self-ignition. Following combustion of enriched oil shale, ash remains which also has to be deposited. The most toxic waste (semicoke) comes from the oil-shale chemical industry. Power stations using oil shale emit large amounts of carbon dioxide and other gases; the groundwater regime, and often also the water quality, are altered inmined-out areas. Environmental effects and the resulting immediate hazards were greatest in the 1980s, now the situation is improving. In this paper, an attempt is made to investigate the performance characteristics of a photovoltaic (PV) and photovoltaic-thermal (PV/T) system based on energy and exergy efficiencies, respectively. The PV system converts solar energy into DC electrical energy where as, the PV/T system also utilizes the thermal energy of the solar radiation along with electrical energy generation. Exergy efficiency for PV and PV/T systems is developed that is useful in studying the PV and PV/T performance and possible improvements. Exergy analysis is applied to a PV system and its components, in order to evaluate the exergy flow, losses and various efficiencies namely energy, exergy and power conversion efficiency. Energy efficiency of the system is calculated based on the first law of thermodynamics and the exergy efficiency, which incorporates the second law of thermodynamics and solar irradiation exergy values, is also calculated and found that the latter is lower for the electricity generation using the considered PV system. The values of “fill factor” are also determined for the system and the effect of the fill factor on the efficiencies is also evaluated. The experimental data for a typical day of March (27th March 2006) for New Delhi are used for the calculation of the energy and exergy efficiencies of the PV and PV/T systems. It is found that the energy efficiency varies from a minimum of 33% to a maximum of 45% respectively, the corresponding exergy efficiency (PV/T) varies from a minimum of 11.3% to a maximum of 16% and exergy efficiency (PV) varies from a minimum of 7.8% to a maximum of 13.8%, respectively. Micro-combined heat and power (CHP) holds great potential for lowering energy cost and CO2 emissions in the residential housing sector. Of the various micro-CHP technologies, fuel cells, and in particular solid oxide fuel cells, show great promise due to their high electrical efﬁciency and resulting low heat-to-power ratio that is better suited to residential applications. However, fuel cells are still under development and the capital cost of units available today remains high. This paper looks at the technological aspects and operating modes of fuel cells relevant to micro-CHP as well as examining the state of commercial development, life cycle issues and the techno-economics of fuel cells for micro-CHP at the residential scale. Benthem, van A., Romani, M., 2009, Fuelling Growth: What Drives Energy Demand in Developing Countries?, Energy Journal, International Association for Energy Economics, Volume 30, Number 3. This paper investigates the relationship between energy demand, economic growth and prices in 24 non-OECD countries and three sectors from 1978 – 2003. We estimate linear and non-linear income and price elasticities, using time fixed effects to control for unobserved dynamic effects such as technological change. We also test for asymmetric responses to price changes. The analysis leads to the following conclusions. First, the income elasticity of energy demand is high and increases with income, both on the country and the sector level. Second, energy demand is more responsive to end-use price than international oil price changes. Third, the price elasticity of energy demand increases with the price level. This result, driven by the residential and agricultural sector, is new to the literature for developing countries, and is consistent with the hypothesis of stronger responsiveness to high energy prices. Finally, we find that after including time fixed effects, allowing for price asymmetry adds little to the results. Traber, T., Kemfert, C., 2009, Impacts of the German Support for Renewable Energy on Electricity Prices, Emissions, and Firms, Energy Journal, International Association for Energy Economics, Volume 30, Number 3. Most models that are used to analyze support policies for renewable electricity neglect important market features like oligopolistic behavior, emission trading, and restricted cross-border transmission capacities. We use a quantitative electricity market model that accounts for these aspects and decompose the impact of the German Feed-in tariff (FIT) into two frequently counteracting effects: a substitution effect and a permit price effect. We find that the total effect of the policy increases the German consumer price slightly by three percent, while the producer price decreases by eight percent. In addition, emissions from electricity generation in Germany are reduced by eleven percent but are hardly altered on the European scale. Finally, it turns out that price-cost margins of almost all firms are increased by the FIT, while nonetheless, the profits of firms are significantly lowered unless the firms combine relatively carbon-intensive production with a weak connection to the German grid. The modelling of production in microeconomics has been the subject of heated debate. The controversial issues include the substitutability between production inputs, the role of time and the economic consequences of irreversibility in the production process. A case in point is the use of Cobb–Douglas type production functions, which completely ignore the physical process underlying the production of a good. We examine these issues in the context of the production of a basic commodity (such as copper or aluminium). We model the extraction and the refinement of a valuable substance which is mixed with waste material, in a way which is fully consistent with the physical constraints of the process. The resulting analytical description of production unambiguously reveals that perfect substitutability between production inputs fails if a corrected thermodynamic approach is used. We analyze the equilibrium pricing of a commodity extracted in an irreversible way. We force consumers to purchase goods using energy as the means of payment and force the firm to account in terms of energy. The resulting market provides the firm with a form of reversibility of its use of energy. Under an energy numeraire, energy resources will naturally be used in a more parsimonious way. The growing industrial metabolism is a major driver of global environmental change. We present an assessment of the global use of materials since the beginning of the 20th century based on the conceptual and methodological principles of material flow accounting (MFA). On the grounds of published statistical data, data compilations and estimation procedures for material flows not covered by international statistical sources, we compiled a quantitative estimate of annual global extraction of biomass, fossil energy carriers, metal ores, industrial minerals and construction minerals for the period 1900 to 2005. This period covers important phases of global industrialisation and economic growth. The paper analyses the observed changes in the overall size and composition of global material flows in relation to the global economy, population growth and primary energy consumption. We show that during the last century, global materials use increased 8-fold. Humanity currently uses almost 60 billion tons (Gt) of materials per year. In particular, the period after WWII was characterized by rapid physical growth, driven by both population and economic growth. Within this period there was a shift from the dominance of renewable biomass towards mineral materials. Materials use increased at a slower pace than the global economy, but faster than world population. As a consequence, material intensity (i.e. the amount of materials required per unit of GDP) declined, while materials use per capita doubled from 4.6 to 10.3 t/cap/yr. The main material groups show different trajectories. While biomass use hardly keeps up with population growth, the mineral fractions grow at a rapid pace. We show that increases in material productivity are mostly due to the slow growth of biomass use, while they are much less pronounced for the mineral fractions. So far there is no evidence that growth of global materials use is slowing down or might eventually decline and our results indicate that an increase in material productivity is a general feature of economic development. Xing-Ping Zhang, Xiao-Mei Cheng, 2009, Energy consumption, carbon emissions, and economic growth in China, Ecological Economics, Vol. 68, no. 10, pp. 2706-2712. This paper investigates the existence and direction of Granger causality between economic growth, energy consumption, and carbon emissions in China, applying a multivariate model of economic growth, energy use, carbon emissions, capital and urban population. Empirical results for China over the period 1960–2007 suggest a unidirectional Granger causality running from GDP to energy consumption, and a unidirectional Granger causality running from energy consumption to carbon emissions in the long run. Evidence shows that neither carbon emissions nor energy consumption leads economic growth. Therefore, the government of China can purse conservative energy policy and carbon emissions reduction policy in the long run without impeding economic growth. Matthew P. Thompson, Darius Adams, John Sessions, 2009, Radiative forcing and the optimal rotation age, Ecological Economics, Vol. 68, no. 10, pp. 2713-2720. Forests help mitigate climate change by sequestering atmospheric carbon. However, boreal and high-latitude temperate forests may also contribute to global warming due to the albedo effect. The relative effects of carbon sequestration and albedo can be quantified in terms of radiative forcing. We present a stylized, stand-level analysis to determine the optimal rotation age when considering a tax/subsidy scheme based on radiative forcing and the notion of equivalent carbon emissions. Additional management decision variables considered include species choice and regeneration effort, since these can impact the albedo effect. We demonstrate analytically that the optimal rotation length is likely shortened when albedo-related equivalent emissions are incorporated, relative to a policy based only on carbon. Empirical results indicate that rotation ages do decrease relative to a “carbon only” policy, and approach the traditional (timber only) Faustmann rotation age as equivalent emission rates increase. Our results suggest that forestation does not necessarily provide climatic benefits in all circumstances, and that, at the margin, other opportunities for carbon reduction (e.g. abatement), or pursuing forestation in other locations, become more attractive. Marine ecosystems are complex, and many marine species are ecologically interdependent. As a result, losing a species could produce a cascading effect on other species. Fishery scientists advocate an ecosystem-based approach to fishery management to meet long-term sustainable goals. This paper models the complex interrelationships among species and the relationship between biomass growth and phenotypic diversity. We found that the equilibrium stock and catch/yield levels are overestimated when the diversity is not accounted for. Consequently, if species are diverse, fishery policy based on a single fishery management could overestimate catch potentials and potentially results in biological overfishing and stock collapse.